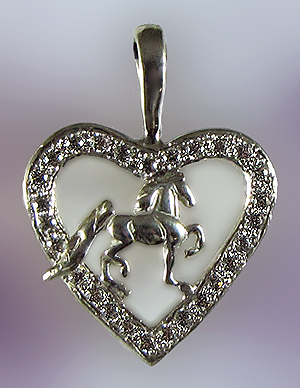 "Saddlebred in a Heart of Sterling Silver set with Cubic Zirconia"
Valentines or any special occasion! Saddlebred horse in a sterling silver heart set with cubic zerconia! The Gorgeous Horse your number one source for Saddlebred jewelry. Here we have a beautiful Saddlebred horse in a sterling silver heart set with 27 cubic zerconia and rhodium plated to bring this piece to life! Dimensions: 3/4 inches wide x 3/4 inches tall.